So maybe I’m a Google fanboy, but I love a number of their applications. Maybe love is the wrong term, I certainly appreciate their applications. Picasa is a great bit of software for dealing with all those digital images. Notebook, Gmail, Google Docs and Spreadsheets. Then you’ve got their telephony app Goog411 and their SMS search capabilities. Let’s face it, they’ve got some cool stuff. Through a side conversation with Mike I found out about Google Sketchup. It’s awesome. A quick, easy and fun way to model things in full 3D. 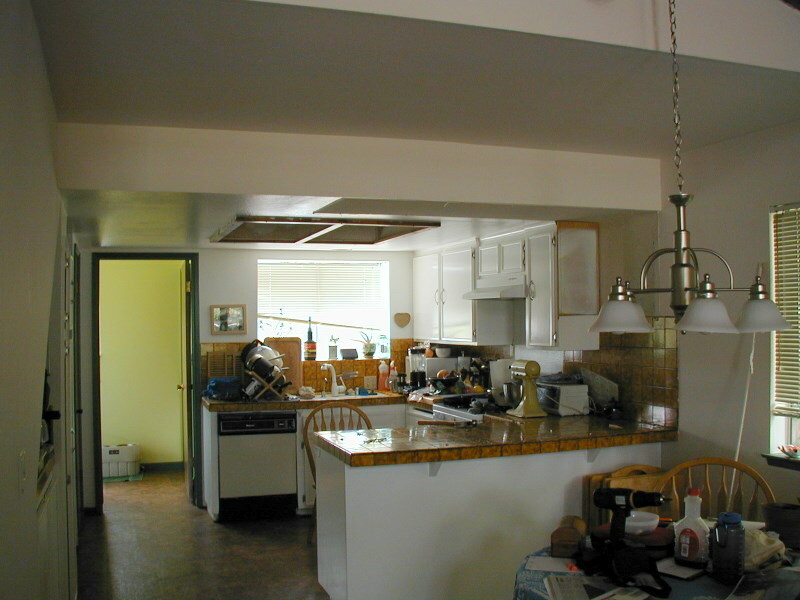 I’ve been looking for ways to model my kitchen in order to figure out how to remodel it (in reality). I’ve had a piece of architectural foam board staring at me for a while. 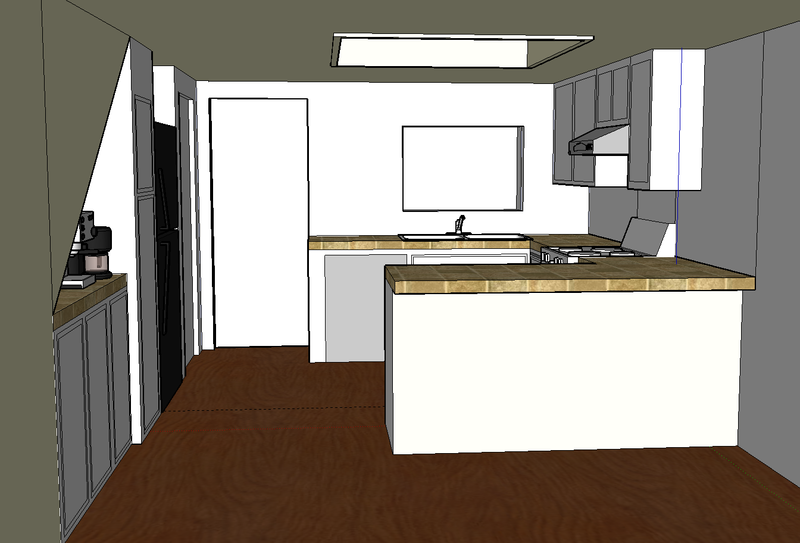 I was thinking I’d cut out counters and mark out the floor plan and get busy, and then came Google Sketchup. It’s a great tool for the geek handyman. Check out the tutorial videos to really see the power of it. Here is my first attempt at a kitchen model. It took a few hours to build after I took measurements of the kitchen and that time includes watching tutorials and learning the tool. After a few more hours, it would probably only take about 15 minutes, if that, to recreate. I didn’t take the time to model all the clutter, but I’m sure you could. Yep, this thing flies, apparently. It’s powered by four solid-fuel rocket engines. I’m disappointed that it doesn’t fire lasers and proton torpedoes, though. I’d love to be able to take out bad drivers on the freeway. They’d have a heck of a time trying to explain things to their insurance company. We just need one of these for coffee and we’ll be set to face anything our cubicle jobs can dish out. Craig’s List is an incredibly handy tool, yet since it was born of the internets, it inherits the good, the bad and the ugly of the internets as well. I received the following via a co-worker today. Who knows if it’s true–there’s no link to the original ad? At this point, it doesn’t really matter. The response is golden. Okay, I’m tired of beating around the bush. I’m a beautiful (spectacularly beautiful) 25 year old girl. I’m articulate and classy. I’m not from New York. I’m looking to get married to a guy who makes at least half a million a year. I know how that sounds, but keep in mind that a million a year is middle class in New York City, so I don’t think I’m overreaching at all. I am, nor is she a great genius. So what is she doing right? How do I get to her level? Is there an age range I should be targeting (I’m 25)? Why are some of the women living lavish lifestyles on the upper east side so plain? I’ve seen really ‘plain jane’ boring types who have nothing to offer married to incredibly wealthy guys. I’ve seen drop dead gorgeous girls in singles bars in the east village. What’s the story there? Jobs I should look out for? Everyone knows – lawyer, investment banker, doctor. How much do those guys really make? And where do they hang out? Where do the hedge fund guys hang out? Please hold your insults – I’m putting myself out there in an honest way. Most beautiful women are superficial; at least I’m being up front about it. I wouldn’t be searching for these kind of guys if I wasn’t able to match them – in looks, culture, sophistication, and keeping a nice home and hearth. I read your posting with great interest and have thought meaningfully about your dilemma. I offer the following analysis of your predicament. Firstly, I’m not wasting your time, I qualify as a guy who fits your bill; that is I make more than $500K per year. That said here’s how I see it. Your offer, from the prospective of a guy like me, is plain and simple a crappy business deal. Here’s why. Cutting through all the B.S., what you suggest is a simple trade: you bring your looks to the party and I bring my money. Fine, simple. But here’s the rub, your looks will fade and my money will likely continue into perpetuity…in fact, it is very likely that my income increases but it is an absolute certainty that you won’t be getting any more beautiful! So, in economic terms you are a depreciating asset and I am an earning asset. Not only are you a depreciating asset, your depreciation accelerates! Let me explain, you’re 25 now and will likely stay pretty hot for the next 5 years, but less so each year. Then the fade begins in earnest. By 35 stick a fork in you! So in Wall Street terms, we would call you a trading position, not a buy and hold…hence the rub…marriage. It doesn’t make good business sense to “buy you” (which is what you’re asking) so I’d rather lease. In case you think I’m being cruel, I would say the following. If my money were to go away, so would you, so when your beauty fades I need an out. It’s as simple as that. So a deal that makes sense is dating, not marriage. Separately, I was taught early in my career about efficient markets. So, I wonder why a girl as “articulate, classy and spectacularly beautiful” as you has been unable to find your sugar daddy. I find it hard to believe that if you are as gorgeous as you say you are that the $500K hasn’t found you, if not only for a tryout. By the way, you could always find a way to make your own money and then we wouldn’t need to have this difficult conversation. With all that said, I must say you’re going about it the right way. Classic “pump and dump.” I hope this is helpful, and if you want to enter into some sort of lease, let me know.